In this kind of culture, when a parent learns that their student is failing a course, many immediately want to know what curriculum is being used, why there is so much homework and what is the teacher doing to help their child. These parents tend to be attracted to state of the art facilities, the latest technological devices, and schools that boast of the certifications of their educational associations. They rarely look at their child and say, “What kind of a student did I deliver to this school? How disciplined and dedicated is my child? How much has he or she sacrificed to achieve excellence? Have they made learning a priority? What other activities, games, trips and personal things are competing with their education?” Do the students believe that learning is their responsibility or are they looking for better methods, better institutions, special attention and shortcuts believing that these will make them what they should be? In learning a martial art, who has the responsibility to see that the student learns? Must the teacher give long explanations, develop focused lesson plans, and work with each student individually? What is the lesson and method of teaching used by the old masters that protected the art from the unworthy and yet rewarded the diligent? Read the excerpts below and see what only a small part of the historical record shows. As both teachers and students, we must all reevaluate what it means to learn and how we can dedicate ourselves to what we want to learn. In doing so, we must take full responsibility for who we are and for what we want to become. We must come to realize that while others can attempt to teach us, the burden is on the student to learn. Our teachers can show us but it is the student who through focus, attention, and sacrifice, learns. In Japanese budo though, the learning is innate or internal. The student learns internally as he experiences the training and discipline of the art. Words, while helpful, are not the main component or catalyst of the learning process. Rather, it is the student, who deals with the issues of ego and attachment, that allows the learning to be internalized and true change to occur. Chiba Sensei and Saotome Sensei don't even look like each other, despite the fact that they were in class together at the same time under the same instructors. And this is due, in my opinion, to the fact that O-Sensei, whom they considered to be their Teacher, did not teach technique but rather allowed each student to develop his own Aikido. But it is clear to me, from training and conversing with these two quite different teachers that each saw the primary inspiration for his own training to be the Aikido Founder. If he (O Sensei) was in the back of the dojo he might come out every day. If he was away, you might not see him for three weeks. If he was there, he might come out for five or ten minutes then go back in. I saw him about 300 times in four years. He never explained what he did, he just did it! This is what I mean by magician. He did it and if you couldn't discern what he did, there was no way to figure it out. He never explained anything but he left hints which were very difficult to discern because of the way he stated his ideas in very short phrases that no one could understand. Actually, I believe that Arikawa Sensei was... someone trying to do what O Sensei himself did. In Hiroshima he showed waza, but did not really teach. After practice ended he was very happy to answer questions, but occasionally told us not to give students certain explanations. They should be required to find out for themselves. The shihan could guide and prevent bad waza, but should not give verbal explanations. Kato: He did not say anything in detail about waza (technique). Rather than listening to his words, I learned by watching him. 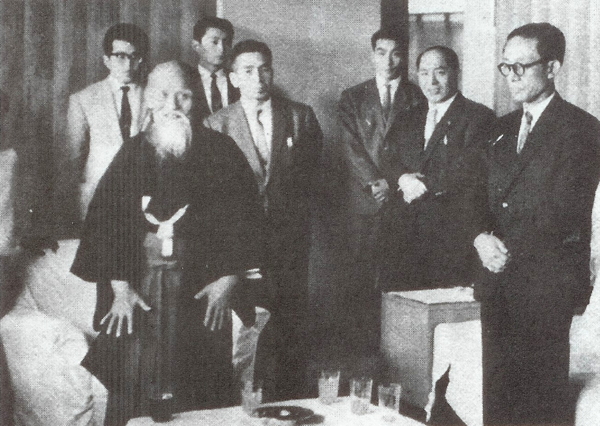 Kato: He said, "Budo (the martial way) cannot be learned from other people. It has to be exercised by oneself." Even now, when I practice, I visualize the founder in my mind. It is not something that can be taught, but must be developed with discipline. That is why I started to understand the things he said. Things I have learned by myself are not easily forgotten, but things that have been taught by other people, without inquiry within me, and taught in the language like "it should be done only in one way, and no other way," are all forgotten. I tell everybody to try it anyway, even if you don't understand it. Results come as you practice. People do not understand when I explain it verbally. Words are a convenient tool, but to show them how is more important. When it comes to teaching, people generally say "This should be done like this." It is easier that way. However, in this way, the amount of verbal instruction tends to increase. Seeing is much better than hearing hundreds of times. It is my great privilege to have had the chance to see the founder doing it. I really feel that I learned Aikido from seeing it. I do not like the concept of instructing others in what to do. I am very adamant about that. For me, rather than teaching, I think practice is the place to begin by oneself. "I heard many times from my teacher, Takeda Tokimune, that Takeda Sokaku sensei never taught the same technique twice. Tokimune sensei told me that at the time he was teaching as his father's Representative Instructor, Sokaku would scold him for being "foolishly soft-hearted" if he taught too kindly or showed his students something more than once. My teacher (Tokimune, Sokaku's son) often warned me, "If you teach the same technique twice, the second time your students will figure out how to defeat you with a counter-technique. Teach something different the second time....Sokaku... showed a technique and left it up to each student to "steal it as much as he was able to. Thus, Daito-ryu techniques vary according to individual interpretations of Sokaku's students. 2. Financial reality - They didn't give away secrets that would jeopardize their (or their families') financial security. 3. Ego - They never let anyone else reach their level so they could keep their power. "See! This is why you are no good. You don't do something simply because so and so said so. If you simply go through life by simply thinking you can copy people you'll never get anywhere. The only person that can do this is you. You must create your own understanding for yourself. ... You must take what you learn, and then innovate it based on your own ideas. ... No matter how much you learn something, if it is simply taught to you, you will forget it. However you will never forget something you acquire for yourself. It becomes you. In other words, teaching is simply a matter of giving the right hints. You must acquire that thing for yourself. Especially in the case of Aiki, it is an internal feeling which must be grasped. It's not simply a matter of questioning everything either. You mustn't simply think that it's enough to be taught. Everyone's body type is different, so there is no guarantee that things will work out exactly the same way. By all that has been presented, I do not mean to imply that verbal communication is wrong as an instructional method in Aikido training. I am also not meaning to imply that we should completely return to previously used methodologies. I am suggesting though that we may need to reevaluate the basis of responsibility in human learning and what the conditions are that give the student the impetus for the learning process to occur. I propose that those conditions are found in the learner himself. Finally, I have to say that in our time, we have seen the decline of our modern educational system. While the cry has been for standardized testing, improved facilities, the additional certification and training of teachers; test scores have dropped lower and lower, our knowledge quota has decreased and we are indeed facing a crises in our educational systems. Our approach as westerners is almost completely external. The approach of Japanese budo is internal. The discipline of Japanese budo intends to bring the learner from the place of ego to the point of egolessness. Every learner finds himself somewhere between the two points of selfishness and selflessness. As the learner progresses from one point to another, humility of heart, openness of mind, and the steadfastness of the spirit become the launching ground for understanding, true knowledge and right practice. Japanese budo is transmitted person to person by means of forms, strict discipline, and etiquette. The students selects the teacher and asks to be received as a student. Once accepted, he enters the dojo and begins to train following directions, learning the culture, etiquette, rules, and submitting to his Sensei and his seniors. The struggle for the student is an internal one. Day by day, the training acts as a forging and refining fire. It tests the resolve and perseverance of the student. The governing factor is in the training and the student is exhorted to continue to train daily. It is through this process that the student of a pure heart (makoto) begins to internalize the essence of the art and its benefits are applied to him. The learner then, has found the place of true knowledge and transformation within himself. (17) A quote from Peter Ralls on Aikiweb.com commenting on the death of Hiroshi Kato. Thinking that I would have given anything to make something of myself in this incredible martial art, I eagerly commuted back and forth to the dojo. But of course, I could never equal the uchideshi (live-in students) who were always serving at Sensei's side. So it was inevitable that I, too, had to be by Sensei's side to take in as much as possible. Thus, I became an uchideshi at the age of 19. At that time I was going to Takushoku University but I was devoted to Aikido more than anything else and so I took a leave from school. I was allowed to take two years off. Once I hit the three year mark though, I would be removed from school altogether. I immersed myself whole heartedly in Aikido for two years with an absolute resolve to become a top uchideshi. Once I became an uchideshi, I lived with Sensei and took care of all his daily needs, no matter what they were. All shugyo (spiritual purification through hard training) is like this, no matter what kind it is. It's the same as the apprenticeship programs of years gone by. You never complained to your master. You simply kept silent and did as you were told. Giving your opinion was absolutely out of the question. If you ever asked something like, "Isn't it better to do it this way?" you would catch holy hell immediately! People today probably think that this is a bit unreasonable, but if you want to master a particular path or way, my feeling is that this kind of intensive training is necessary. For no matter how well you know the pre set forms and procedures of the techniques, this alone will not make something a martial art. This is especially true in the case of Aikido. In order to master Aiki techniques, simply drilling in sports-type training is not sufficient. To achieve this mastery of a martial art, nothing is better than solid shugyo in which you share daily life with your teacher in absolute obedience. And yet, you won't gain anything by simply living with your teacher. The important thing is, in taking care of all his needs, to continually sense your teacher's feelings before they are made known to you. In the end, you are striving to be able to perceive his intentions. If you are helping Sensei in the dojo, you should be able to determine what Sensei will want next and do it for him before he says anything. Watch Sensei's movements continuously; then understand the changes in his feelings. But here's the difficult thing. If you see something and then think about it and then set to work on it, it's already too late. You can't think about it. You have to be able to discern instinctively what Sensei's feelings are right away, on the spot. This is the natural way. It's not about thinking, just sense it naturally. I always made it my goal to try to do things this way and as a result, I developed an ability to sense my opponent's intentions. Before long, this kind of training carried over into demonstrations as well. When performing as Sensei's uke, although fundamentally it doesn't matter where you attack, the point initially is to show the audience. So, for example, Sensei might present his shoulder and say, "Grab here." The average person would then go in and grab his shoulder. My goal was to perceive his intent and go in and grab his shoulder before he could say a single word. It is an unspoken, heart to heart way of communicating. If you can't do this, then you can't move naturally. I studied this sort of thing. So now when it's time for me to do a technique I can apply what I studied and can tell where the opponent intends to attack. In the dojo community, there is a teacher, experienced disciples, and beginners. The teacher is called Sensei. The advanced pupils are called Yudansha (black belts), the beginners are called Mudansha (unranked and kyu ranks).You will not become a Yudansha only by improving your ability. It is also necessary to strengthen your mind and soul according to the way of the warrior. A Yudansha always gives more to the dojo than he takes. For him, the dojo is more than a sports center. It is a part of his life and the members are a part of his family. It has been for some time now that as I have been thinking about what Aikido is and what it does for the individual, that a new thought has occurred to me. The thought is that in order for Aikido to make a psychological change in an individual, there has to be a certain kind of environment and a certain kind of relationship with the teacher. I first began to look at this old idea in a new light when I would see so many people coming to our dojo seeking something for their children. The parents seemed to have this intuitive belief that martial arts would help the particular thing that they saw their child needed a change in or help in. As I strove to help their children, I quickly realized some things. 1) You can't help someone who doesn't want to be helped. 2) You can't help someone (particularly with Aikido) who isn't trying to do their best. 3) You can't help someone who resists discipline. In the first case, you have the problem of motivation. If the person isn't seeking change, they won't change. What seems to change them without their knowing it is when they like the art or they respect the teacher. Then they want to do well so they find the motivation to give it their all. In the second case, some people are self starters and always do their best while others are lazy, demotivated and have poor concentration and diffusion of thought. These lack the intensity to pass through the fires of real change. Any experience that processes a real change in someone is an intense one. Lastly, in most endeavors, be it school, your job, the military or a martial arts dojo, the discipline is the key. Self disciplined people do the best but institutions like the military have a form of forced discipline and that processes change as well but that change can be for the better or the worse in the person due to the enforced nature of the process. I realized that in a traditional martial arts dojo, everything is about the discipline. The rules of etiquette are not only about the social nature of the institution but about the parameters of behavior each person is required to adhere to. How strictly that is enforced and how the student receives it is the key. There is also the factor of abuse. In many situations in western culture authority soon becomes authoritarianism. This is abuse in the sense that it comes from the top down and may not take into account the feelings of those below. Authoritarianism lacks compassion for it's followers. This happens in many cases. Recently, I was thinking about my master teacher from Japan. By training, he follows the rules of protocol of Aikido but I have noticed that he never demands it from anyone. Everyone gives him their obedience because they respect him but I have never seen him ask anyone to do any of the things the protocol asks for. He fully expects it to come from you. He once said that "Aikido is not something to learn from others, but to learn by oneself. Ideally, the practice should be for oneself, and it should be rigorous and sternly self-disciplined, by one's own choice." This voluntary giving of oneself to Aikido and it's processes is what changes an individual. It has to come from the person though. The heart must be soft, obedient and pliable in the hands of a good and honest instructor of Japanese budo in order to see the psycho social transformative change that so many are looking for. If you think of Aikido in this way, you will realize that almost the entire training of Aikido is discipline. From the time you walk through the door, in its etiquette and rules, there are rules for almost everything. On the mat, you are subject to the discipline and instruction of the Sensei or instructor. Almost every word and action is corrective in nature thus falling under the category of discipline. Then there is the aspect mentioned in the quotes above. In the early days of Aikido, it was considered a budo which was a particular form of austere training by which you would undergo severe training taking you from the ego self to the egoless self thus finding your true (purified) humanity. This process was not automatic and many people resisted it naturally, but some submitted themselves to it and for these, the training went to higher and higher levels. If Aikido is a training of the mind, then the relationship with the teacher in terms of authority, submission to his instruction, directions and discipline were the keys to the psycohological and social changes in the practitioners. I think that this is the point where many of my readers will take exception to my comments and part company with me. I think though that I need to direct you back to what my teacher says. He said that "Aikido is not something to learn from others, but to learn by oneself. Ideally, the practice should be for oneself, and it should be rigorous and sternly self-disciplined, by one's own choice." This is the key. It is not the instructor who forces the student to submit or follow. That always comes from the students and the students should always think for themselves and rule over their own mind and conscience. In a real budo relationship, the instructor is a guide and a mentor who leads by example and by setting the parameters of the protocol. The students set the level of their obedience. The instructor has the option to help and reward those who are following him and are obedient to his instructions (with regard to the training). Gozo Shido Sensei understands that modern people would highly resist this kind of training lacking the background and mindsets of the past but still, he makes clear that the training of sensing your teacher's desires was one of intuition and sensitivity that would take your martial abilities to another level in terms of being able to sense your opponent's next move. Physical training alone can do that but sensing the needs of others is indeed a master level skill. To tune yourself to the teacher at that level is a relational skill that goes to the kind of human you are rather than the kind of warrior you are. Nishio Sensei, in the third quote, goes on to describe the dojo as a place structured for the care and discipline of its members. He shows that the dojo or training hall is a place of heirarchy and order and that the purpose of that is for the care of each other. The psycho-social transformative change that Aikido as a budo brings is a long process that works on an individual outwardly through the forms, disicpline and etiquette of the art. The inward, compassionate and relational aspects of the changes are personal in nature and come from a close and direct relationship with a mentor and guide that you truly respect and love. It is in these two poles of tension that we are stretched into change. This kind of training is not for everyone and it may well be that its time has passed but if that is the case, then the era of Aikido as a budo will have passed and it may be then that the hopes and dreams of Morihei Ueshiba for Aikido will never be realized. Within the limits of common sense, compassion, rationality and good judgement on the part of the teacher, I think that we still need the expressions of the budo of the past for people today. It has to be voluntary though and the teacher must never be abusive in his leadership but must always have the well being of his students in mind as a guide in transforming human character through budo. Kato: I did not have a particular interest in Aikido, but I wanted to learn martial arts. My mother knew someone who...also knew the founder of Aikido. So, without any specific intention, I started to practice around Showa 28 (1952). Kato: He did not say anything in detail about Waza (technique). Rather than listening to his words, I learned by watching him. I haven’t accomplished what I saw—probably less than half of it. When he took my hand, I felt like I was being absorbed into him because of his God-like presence. Aikido is not Kumiuchi, traditional martial techniques for fighting. If Aikido were like techniques for fighting, the way of practice itself would be totally different. But Aikido practice consists of ways to develop ourselves and each other. Of course, it is not saying that being weak is acceptable — through our experience of strength we are not tempted to fight. Aikido is not about competition. A person who has true strength does not fight. I love (these) words. Let us practice together. The Art of Aikido in a Short Summary. There are many misunderstandings about what Aikido is, it's training and it's form of self defense. I have written a short article in order to help make clearer the three issues for our students. Please consider the following for your own training. Aikido is a Japanese budo (martial way) which Morihei Ueshiba conceived as a way to "find harmony with the universe". This meant to him that the training and customs of the art would work to change the character of the practitioner. The techniques teach a certain way of "Ki". This is to say a way of using Ki or the body's life energy as the techniques are being performed. The movements can be soft or hard but they have an ethical component as well which is peace and not injuring the opponent unnecessarily. If an attack is particularly violent, the attacker could injure himself though but even in that, he would be brought back into a state of non attack with the defender. The real question of Aikido though is this - "Is there attack in me?" Do I want to hurt and injure? This is what our training is for. To deal with our own lack of harmony. In the dojo, we practice this training of mind - body - Ki coordination to stand in this harmony. In a sense, the techniques are the training tools. The Budo (or "the way of war") means that we use martial or ancient Japanese war techniques to train ourselves with an ethic of peace. That is what we try to manifest in the dojo. That is what we are training. That is why we try to take care of our classmates and train together. Aikido then is a complete practice of Misogi. It is a purification of mind, body and heart. It is something to be done with dedication, intensity and pure heart. it was made to be an art that would purge you of spiritual impurities and that is why he reasoned that the end of Aiki was love. Here is a summary of what I am trying to say from the homepage of the Aikikai Foundation. "A pure budo comes with the unification of technique, body and heart. The budo, which will manifest itself, does not depend upon the technique, but rather upon the heart of the practitioner. Budo is the path of the warrior. Combined with the spirit of heaven and earth in your heart, you can fulfill your life's destiny with unconditional love for everything. Aiki seeks to skillfully strike down the ego and inherent insincerity in battling an enemy. Aiki is the path of forgiveness and enlightenment. The martial techniques provide discipline for the journey of uniting the spirit and the body through the laws of heaven. The goal of Aikido training is not perfection of a step or skill, but rather improving one's character according to the rules of nature. One becomes "resilient" inside yet this strength is expressed softly. Movements found in nature are efficient, rational, and soft,while the center is immovable, firm, and stable. This principal of a firm center is universally consistent -- and must be true for each person. The culmination of Aikido is expressed by aligning one's center with the center expressed throughout nature. Although Aikido movements are soft, rational, and smooth as in nature, by applying a bit of force,these can become devastatingly effective. The gentle quality of Aikido makes it appealing to men and women and children regardless of age. It not only offers spiritual development but also provides exercise and teaches proper etiquette and behavior." In our training, it is a very physical training. Aikido is considered a soft art because we don't emphasize using force or direct strength. It is also soft because it is an art where you are working with yourself internally as much as you are externally. In other words, it is as much about using the consciousness or mind as much as the body. Of course though, anyone can tell you who has done Aikido that soft doesn't mean non-physical or easy. Aikido can be every physical and powerful as well. Understanding that, everyone in Aikido should train at their own pace and physical ability. The training should not be forced according to O Sensei. Having said that though, we also need those students who have great ukemi or are a little tougher because that way, we can all see the ultimate in the technique. So with their permission, we can also go a little harder and train more realistically sometimes, with less fear of causing an injury. That is what I try to show as the Sensei. I try to show how the techniques should look in a realistic application. As the students though, you should not always copy me because I am doing the job of a Sensei. You should train normally, safely and in harmony with your partner . If you are training with a brown or black belt, you can ask permission to go harder and I am sure they will oblige but beginners (anything below brown) should not go too hard with other beginners. You can pick an advanced person to go harder with but always ask their permission first. We shouldn't surprise anyone with a hard technique when they aren't expecting it. Only the Sensei can do that because he has the ultimate responsibility for the students safety. I appreciate people who can take very good ukemi or others who are very tough because I know I can apply the techniques in a way so that the others can see the power but I am also fairly certain they won't be injured when I do it. To apply a technique strongly is a serious responsibility. That is one of the reasons why we don't have competitions in Aikido. The techniques applied in the heat of competition could most seriously hurt someone and if you didn't go all out in a competition, you wouldn't win so it would become a very serious completion indeed. The main reason we have no competition though is because the Ueshiba family believes that would promote the ego which it is the aim of Aikido to suppress. Please read the book, The Spirit of Aikido, for a more complete explanation. Aikido is a series of principles more than it is a series of techniques. 3) Proper foot movement. (ashi sabaki) Swordsman foot movement. 5) Using your whole body to move the opponent's whole body. 12) Capturing the person in your motion. So, in a self defense situation, we might use Aikido techniques, we might also use a part of a technique or something could manifest itself that doesn't necessarily look like an Aikido technique. Our training though is in Aikido principles and if you train properly, it is the principles that will manifest themselves in self defense situations. This is our art in summary. It has the aspect of ethics and philosophy. It has a specific kind of training and it's emphasis is on harmony (ai), peace (wa) and internal change (makoto no kokoro - a sincere heart). I hope you can consider these things as we all continue in our training.